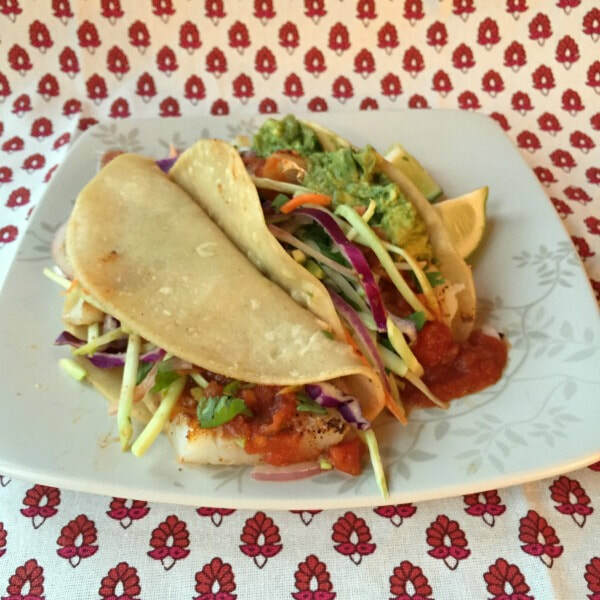 These Fish Tacos are a super quick and easy dinner recipe that's full of flavor. The onion and cilantro on top adds a nice crunch! Try these Vegetarian Tacos​ for another simple and healthy recipe for taco night! Mix onion, cilantro, coleslaw, and juice of half a lime in a bowl and set aside. Heat your oven to the broil setting. Coat a baking sheet with cooking spray. Lightly sprinkle fish fillets with chili powder or Caribbean Jerk Seasoning and lime juice and place on the baking pan. Move the rack in your oven about 6 inches from the top burner and place your baking sheet on that rack. Cook for approximately 5 minutes, or until fish is fully cooked. You will know the fish is done when it flakes. Heat ½ teaspoon of oil in a frying pan and lightly fry tortillas for a few seconds, or heat tortillas in the microwave oven until softened and hot (10-15 seconds). Fill tortilla with fish, coleslaw mix, and cilantro and fold in half. Serve with salsa or optional toppings, if desired.